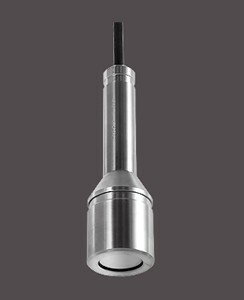 NIVOPRESS N Hydrostatic Transmitter - HiTECH Technologies, Inc. The NIVOPRESS N hydrostatic level transmitters are designed to measure the level of clean or contaminated liquids. The pressure sensor at the bottom of the probe measures the sum of the hydrostatic pressure (Phydr) of the liquid column above it and the atmospheric pressure (Patm). The atmospheric pressure is led to the sensor through a breathing capillary which is equipped with a moisture filter that prevents the moisture reaching and damaging the electronics. This enables the atmospheric pressure to be subtracted from the measured pressure to get the hydrostatic pressure which is proportional to the height of the liquid column (h). The electronics converts the sensor’s signal into an output signal. If temperature measurement (of the liquid) is needed beside the level measurement a combined (level + temperature) transmitter should be used. The installation and wiring of the transmitter is helped by the wide variety of accessories. A sewage adapter working on the principle of the diving bell can be snapped into the place of the protecting cap to avoid the direct contact between the sensor and the measured contaminated liquid. An extra mechanical protection is built in the NZ type transmitters in the form of a mechanical filter. The N-500 types can be used in hazardous environments. The NZ screw-in types are recommended for applications where there is a risk of flooding.